Want a horse but can’t afford it? Recently, I wrote an article called 10 Reasons Your Daughter Should Own a Horse, which detailed all the benefits of horse ownership for teenage girls. Now, I’ve been compelled to address the next logical step in the consideration process. There are lots of benefits to owning horses, but the first blockade to ownership is the financial investment that has to be made. Horses cost a lot of money, no matter how much of a great influence they may have on your son or daughter. Horses are a lot of work, but that work takes skill and knowledge. Volunteering teaches girls how to do that work, either for their own horse or a job down the line. Learning how to do things like mucking stalls, clean tack properly, put on blankets, and doing turn out are all great experience. Most barns won’t turn down free help, as long as your daughter is old enough (normally 10-12 is a great age to start working). There’s a reason volunteering is #1 on the list. It is a great stepping stone for your daughter to prove her work ethic, commitment, focus, and all of the other characteristics that a barn manager is going to enjoy having in the barn. Once she can do that, it’s always possible that your trainer may consider trading work for lessons or free riding time. Most won’t do this until she proves she’s proficient at her work, knows what to do, and is consistently reliable. A good arrangement is to have her arrive a few hours before her lesson time to volunteer, and then build up to adding another day during the week when she can work. The key is to offer help, not to use the barn as a babysitting service (a common complaint from barn owners). A barn owner wants a young volunteer who is thorough (even if that means slower) because it means that they won’t have to re-do the work. When your daughter is done with a task, she should go to the barn owner and say, ‘what else can I do?’ or ‘how can I help next?’– those are words that a barn owner wants to hear instead of having to constantly push their young volunteer to stay on track. Leasing is when you pay to ride outside of a lesson situation a certain number of days per week. 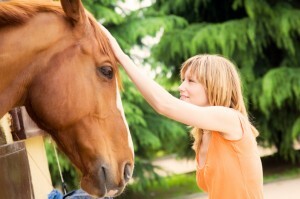 It has a lot of the benefits of owning a horse, but is more of a temporary commitment with limited responsibility. It earns #2 on this list, because it’s a common arrangement at any lesson barn, and is easy to get started with. It usually costs about half of whatever boarding a horse at that barn costs ($175-$400 per month). This is commonly considered the “pre-buying” step, but it’s also a great option for those families that will never buy a horse. Leasing a lesson horse is common because it allows your daughter to practice skills that she’s already working on, with a horse who is comfortable and familiar to her. Leasing private horses is another option, common with horse owners that can’t make it to the barn enough or want to split the cost of board. If it’s a private horse, make sure that it’s calm and dependable, and well trained enough for your daughter to be comfortable riding on her own. Here’s how it works: When she leases a horse, she will pay a monthly fee and have a few allotted time slots or days each week that she can come ride. Some leases are strict, where she’ll have to plan a time for a number of months and that is the only time the horse will be available to her. Other leases are more flexible, especially with private horses. Most leases require that some adult be at the barn while she is riding (be it you as a parent, a barn owner or trainer), and that she still participate in a minimum number of lessons per month (2-4, depending on where you lease). Once she’s volunteered and taken lessons at a barn for a while, she (and probably you too as a parent) will begin to become very involved in the barn’s community. Becoming a working student is a common situation available if your daughter has proven that she’s a hard worker and is helpful. This is the next step up from volunteering. She will be doing the same kind of work (all those skills that she perfected while volunteering), but now she will do it in exchange for credits towards lessons or leasing. Every barn is different and will have a different monetary/credit exchange for hours worked. If your barn is local, you can sometimes arrange to have a school bus drop her off at the barn certain days of the week, to lessen the driving time for you as a parent. If your daughter is volunteering or is a working student, she is actively proving her value in the barn every day. Both her instructor and other horse owners in the barn will begin to take notice of that. There are often times where a horse owner will be out of town for a week and may ask your daughter (who will now be more experienced) to ride for a bit. You can’t bank on this opportunity– it may just emerge someday. This sort of thing happens all the time, but you or your daughter can’t make it happen. Because it’s more unpredictable, it’s earned the #4 spot on this list. Free leasing is another similar option, though it’s less common in lesson barns and is geared towards students who are much more experienced and can help train a horse. A free lease is a lease arrangement that doesn’t cost the student any money– it’s a lease where the student rides for free on set days or times. This happens in situations where the horse owner feels that the riding your daughter is providing helps them and the horse enough that they’re willing to not charge for you for access to the horse. If owning a horse is simply to expensive for your family, that’s okay. There are lots of other ways your daughter can get involved at the barn and with horses, and she’ll still reap many, if not all, of the benefits of horse ownership. So get out there and talk your barn owner, manager or instructor about the options available to her! And if that barn won’t accommodate these ideas, perhaps others in the area might. If you need to, take a look around and talk to others in the area. You (and your daughter) won’t regret it. A last note: Don’t forget about the boys! Because this blog is geared towards girls and women, this is who I talk to– but think of all of these ideas for your son as well! Your teenage sons will have every benefit that your daughters would.